We just returned home from seeing Where The Wild Things Are, and I am feeling quite deflated about the whole thing. I know, a book with only 339 words leaves a lot of room for interpretation over the space of an hour and a half. 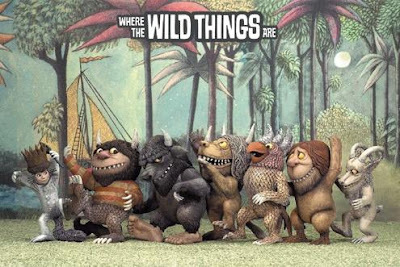 I expected it to be a little dark, but also a little more lighthearted... ya know, like a kid's movie about "Wild Things" ought to be. I didn't expect it to be so dark and deep. I really don't know how they got away with billing this as a children's movie. Just putting "puppets" in a movie does not qualify it as a children's movie (as with Coraline, once again, I'm VERY glad I went to see it before taking the ShortBus). Honestly, I am disappointed in the interpretation of the book. I realize that Maurice Sendak had a hand in the development of the movie, he completely intended for it to be a commentary about the psychology of early childhood development. The post-toddler/pre-teen dealing with the struggles of the growing desire for independence versus the need to have continued dependence upon one's parents. But did it have to be so textbook? I'm pretty sure I had a professor or two in college who could have taught a whole class based around this movie. I really would have loved for this to be a movie for younger children. Something geared a little more toward a literal interpretation of the book (at least the literal interpretation as I see it). A little boy, behaving in such a way that he gets sent to bed without his supper, and his room actually becoming another world that he escapes to. He has some fun with the "Wild Things," but as the story progresses he realizes he misses his family, and life being all "fun and games" isn't as great as it sounds in theory... so he goes home to the one place in the world where there is always someone who will "love you best of all." When he "returns" home, his actions are not reinforced with chocolate cake, but his dinner is sitting in his room, a warm meal which reminds him that even though he misbehaves, his family still loves him and will always be there to take care of him. Sometimes, less is more. This is one of those times when much less could have made it so much more. I have been avoiding seeing this movie for about the same reasons. I would like to see it at some point but I wanted it to be more...er... like you said dark yet light hearted.